At 29, Andrew Luck is having fun playing football again. INDIANAPOLIS — Andrew Luck looks and sounds like his old self. He’s smiling, cherishing each snap. He’s throwing touchdowns and winning games, staying healthy and chasing the kinds of milestones so many expected when the Indianapolis Colts made him the top overall pick in the 2012 draft. Yes, at age 29, he’s again having fun playing football. “I was not in a good spot a year ago. I remember that. I am in a good spot now,” Luck said in his trademark low-key tone following Sunday’s 38-10 victory over Tennessee. Twelve months ago, Luck was questioning everything from whether a second surgical procedure might alleviate the pain in his right shoulder to whether he would ever play another NFL game. He had been shut down for the season by going on injured reserve and headed to Europe, where he continued rehabbing in relative anonymity. 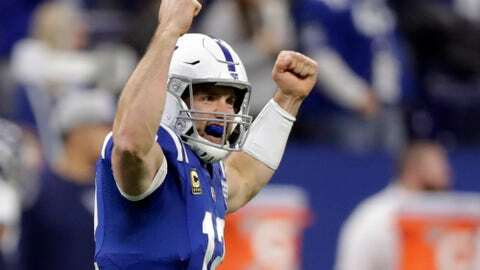 He spent Thanksgiving and Christmas in the Netherlands and when he returned home, just before Indy’s season finale, Luck recounted some of the emotional challenges he faced during his prolonged recovery from a partially torn labrum in his throwing shoulder. Even then, things didn’t go according to plan. The only NFL coach Luck played for, Chuck Pagano, was fired a few days after his return. New England offensive coordinator Josh McDaniels accepted the Colts’ coaching job and then backed out, paving the way for Frank Reich to eventually take over while Luck’s recovery essentially started over. “We were throwing little — I don’t even know what kind of balls they were — weighted balls, but they didn’t have points on them,” Reich said when asked to recount Luck’s status when he first arrived in town. Luck didn’t start throwing footballs until May, didn’t start throwing at practice until mid-June and was kept on a strict pitch count at training camp. So when the Colts started 1-5 and Luck was throwing short, some naturally wondered if Luck would ever regain his pre-injury form. A month later, there are no more doubts. Luck is in the midst of his best pro season with his completion rate (67.3 percent) and rating (101.8) at career highs and his 29 TD passes ranked second in the league to Kansas City’s Patrick Mahomes. Luck has reduced the number of interceptions and forced passes and hasn’t been sacked in five weeks, a total of 214 consecutive drop-backs. The closest Tennessee even came to touching Luck on Sunday was when Luck tried to catch a touchdown pass from tight end Eric Ebron. As a result, Indy (5-5) has won four straight to jump back into the playoff picture. If Luck throws three more TD passes this weekend against Miami, he will tie Peyton Manning (eight) for the second-longest streak of consecutive games in league history, trailing only New England’s Tom Brady (10). And the deep throws have returned, too. But the more people talk about Luck’s gaudy numbers, the more focused Luck becomes on enjoying football and life. If the injury taught Luck anything, it’s how quickly things can change in the NFL. He lost right guard Matt Slauson to a season-ending back injury after Week 5 and now, in the midst of this remarkable streak, he may be missing center Ryan Kelly, who left Sunday’s game with a knee injury in the fourth quarter. Reich said doctors are evaluating Kelly’s knee. The loss of Kelly could be huge, given offensive line coach Dave DeGuglielmo recently said Kelly was playing at a Pro Bowl level and was one of the best centers in the league. Luck understands what it will be like for Kelly if he can’t play. After fighting through the physical pain and mental difficulty, the agony of defeat and the heartache of not being able to help out, Luck believes he has come out the other end as a better player.